Use Wet and Forget for Your Springtime Easy Mildew Prevention – It’s Amazing! If you want instant gratification, then don’t read this. But, if you want medium to long-term satisfaction, then read on. I heard about this little known and not widely carried spray called Wet and Forget several years ago while listening to WGN Radio. Surprisingly, Wet & Forget has been around for over 30 years in New Zealand and Australia, but newer to the United States. Not long ago, I was complaining about my mildew composite deck (Trex decking). Not only my deck, but also my concrete walkway, wood timbers retaining wall, and stones on the north side of my house. 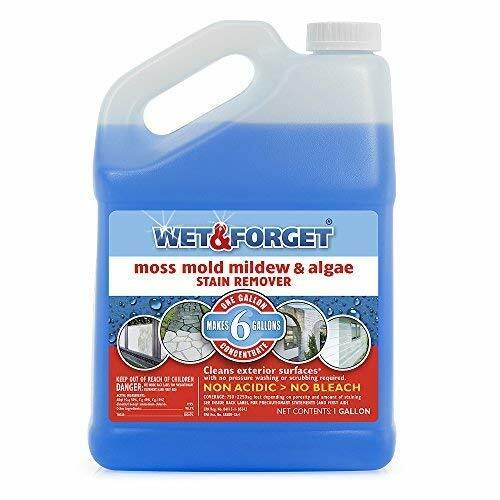 I needed a mold remover, mildew remover, moss remover, and remove the algae stains all with one product. In the shadows, I can see brown and green on the stones and the concrete. Rented a power washer from Home Depot for the day for $40-80. The hardest part is lugging this heavy piece of machinery back and forth in an SUV while dragging a long enough hose around the house from the spigot. The most dangerous part is lifting the power wash in and out of my SUV. The alternative is to go to Home Depot or Amazon to purchased deck spray. If you haven’t used deck spray, it smells like diluted bleach. People think products like Wet and Forget includes deck spray, but they usually aren’t environmentally friendly. The deck concentrate is strong and usually works, but I personally don’t feel as safe with children on the deck, pets, animals, and trees and plants nearby while using it. I usually take a hard broom or get on my hands and knees with a hard-bristled brush and scrub the green or dark spotted algae and mold. I luckily discovered Wet and Forget as an alternative. The benefits of using Wet and Forget vs the alternatives are amazing. Wet & Forget Outdoor product line has a pH level of 8 vs pure water at 7. Most other related products have a pH level of 10-13. Any over spray near your pool will not affect the PH level. Stock up during a sale – it has an unlimited shelf life. Store in an area to prevent freezing. Safe to keep in a sprayer for seasonal use. If you don’t have a sprayer then purchase Wet and Forget Ready To Use. Many times in the past, when I’ve used deck spray or bleach, it ate through or damaged the hose and nozzle of my $10-$20 sprayer. The only way to prevent the damage was to rinse it out thoroughly and run copious amount of water through the tube and nozzle. Unlike when using deck spray, I don’t need to rinse out my handheld pump sprayer with water after each use. The company just started selling Wet and Forget Ready-to-Use. It’s for those who have smaller areas to cover, want to use immediately, and do not want to buy a spray container. It comes in a 64-ounce container. The ready-to-use product comes with a small hose and hand sprayer, and says it covers 60-180 square feet. I recommend purchasing a low-pressure one or two-gallon sprayer container and buy Wet and Forget concentrate to save money. I tend to spray my deck 1-2 times a year, so purchasing the spray container will save money in the long run. Wet & Forget Concentrate coverage depends on the porousness of your surface. Painted surfaces will use less spray while more porous surfaces will need more product. 1 gallon of concentrate makes 6 gallons of spray. 6 gallons generally covers 750-2,250 square feet. Every summer I spray it on my deck, driveway, cement pots, outdoor storage container sitting in the shady, patio furniture, patio furniture outdoor cushions, grill cover, and decorative rocks. I usually respray in the fall because the daylight is shorter resulting in more mildew. Leaves and debris tend to collect on the deck and it keeps the product working throughout the winter every time it snows and is windy. I saw a terrific Wet and Forget review from a user who used it as a roof shingle cleaner. I was asking, Wet and Forget does it work? See for yourself. See Amazon photo. Costco many times carries Wet and Forget Costco at the best price with no voucher required. They sell it in a pack for a total of 1.5 gallons. If it’s in stock, my local Costco charges $24.99. Sometimes there is an instant Wet and Forget coupon for an additional $5 off bringing the price to $19.99. It’s hands down the best price I can find for it. To buy it locally or in rural areas, I suggest purchasing Wet and Forget at Ace Hardware. If you are in the city or suburbs, then purchase Wet and Forget at retailers like Home Depot, Lowes, Menards, or Walmart. Many Home Depots don’t have it in stock, so purchase it online and have it sent to your local store for pick up …and save on shipping! For those cybershoppers, checkout Amazon for Wet and Forget. Tip: Not all containers are created equal. When shopping, be sure to check out the container size. Wet and Forget comes in gallon sizes, but also in half gallon and three-quart sized gallons. At Costco, they package up two .75 gallons to make a 1.5 gallon package. Figure out what you’re paying per ounce or per gallon. What are the Wet and Forget active ingredients? Alkyl dimethyl benzyl ammonium chloride 9.9% is the only active ingredient. Wikipedia says it’s an organic salt. Do you have the Wet and Forget MSDS (Material Safety Data Sheet)? The material safety data sheets communicate the hazards of hazardous chemical products. It’s posted at Home Depot. Click here to review the sheet from 2012. Is Wet and Forget Safe for my pets? Under most circumstance, Wet and Forget is safe for your pet. Though, it’s advised to keep pets and animals off the surfaces until dry. If your pet happens to walk on the wet surface, it’s advised to rinse their paws as a precaution. Once it’s completely dry and if it rains afterward, it’s safe for all. What are the Wet and Forget Directions? The Wet and Forget instructions suggest using 1 part concentrate to 5 parts water. For the best results, apply use Wet & Forget Outdoor when there is no chance of rain for the next 4-5 hours on a cool day. The best time to apply is either early in the morning or in the evening. Don’t use it in direct sun and when the temperature is below 32 degrees. Wet and Forget Outdoor is designed for outdoor use and requires the weather to work properly, particularly with wind. The north side of my deck is shady and damp for much of the year. I use Wet and Forget as a stain remover and preventer because the mildew is scattered throughout my deck. I increased the concentrate to be more proactive and kill moss faster. People tend to see results within days for light contamination and up to 2-3 months for more severe cases. Do not be concerned if your concrete turns orangey brown! The change in color is a good reaction with the Wet & Forget Outdoor and the growth. Tip: Wet and Forget is not meant to remove dirt. If your landscaping is muddy, then you will need a hose and a scrub brush, or a power washer. It’s also suggested to remove any excess debris with a broom so the entire surface is uncovered. Wet and Forget won’t work if you are spraying it over a bunch of leaves on your deck. It will likely leave a residue on the glass, but will not scratch. Wet & Forget Outdoor is a mild product. Use Wet and Forget on Halloween pumpkins! Yes, Jack O Lanterns! I came across this test trying to preserve your carved pumpkin at Halloween. It’s a really cool experiment!